Can you learn something about selling from a trip to the beach? I hope so, or I'll have a hard time writing off part of my trip. When I go there, which for reasons that will become apparent is not often, I cover myself completely and sit in the shade of a large umbrella. Then, like a pre-historic sundial, the umbrella is moved around the chair as the day passes, keeping me in the shade. It's a lot of work. Clearly, visiting a sunny place wasn't my idea, but let's make the most of it, shall we? Have you ever noticed the people who walk along the beach selling stuff? How would you like that job? At some resorts, there will even be a few vendors invited onto the property to sell people by the poolside, and this is where I got the chance to observe hand-to-hand sales up close. What fun! Two salespeople walked from person to person: one with a parrot, and one with a camera. The offering was to have your picture taken with the bird, and later in the day, prospects would go to their office and purchase the picture. Before I get too far in this discussion, I want to be clear that this is not an article about how to sell stuff at the beach. So if you sell cloud computing, staffing solutions, mobile apps, building materials, construction equipment, television advertising or one of 732 other product and service categories, I promise there are lessons for all of us. One of the more simple rules in sales, that some find difficult to execute, is that one should be focused more on the prospect than on the product, at least in the early stages of the discussion. Yet when most of us first start working at a new firm as a salesperson, among the first things we learn are the products and services we offer. So this is where the confusion starts. To be sure, knowing your products is critical to your success, after all, and your ability to present them is often the prerequisite for the sales manager letting you get out there all by yourself. There is little attention paid to your ability to sell, because most companies do not measure it, or don't measure it correctly. In the movie, Tommy Boy, we see that the "teacher" wasn't much better than the student in this area, even though he could say, "the spectrometer readout on the nickel-cadmium alloy mix indicates a good rich strobe and fade, decreasing incidence of wear to the pressure plate," as though he was describing the omelet he had for breakfast. Seldom is sales taught by companies specifically to improve selling skills. It’s like when teachers know their subject matter, but not how to teach it. Have you ever had a teacher like that? How was that class for you? What did you learn? One could ask the same about salespeople who haven't mastered selling. Have you ever run into a salesperson like that? How was that experience? At some stores, you’d grow old waiting for someone who could do more than simply read the product description on the shelf tag as easily as you can. So how did this play out? Less than 3% of the people encountered said, "yes," and presumably some of them only because they felt pressure, but with no intention of purchasing later. That 3% might be enough for them of course, but why not double or triple it, if you can? I bought the photo shoot of course, because I wanted a picture for this blog article, a fact entirely lost on them due to their ineffective sales process and inability to uncover any reasons why I might want to buy what they were selling that day. They must believe that the reasons to purchase are self-evident. How many of your people know your products and services so well, they believe your prospects' reasons for buying it from them are also self-evident? Sometimes, you still get the sale, as they did in this instance. So how could they improve their odds of success and close more deals? How about using some of the same strategies that my clients use? What if we focused on the prospect? What if we made it all about them? It might be impossible to do initial research on our prospects in this case, but we are at a resort, after all, so we could assume that they probably have a smartphone and a Facebook account and they probably plan to tell their friends about the trip. If we're savvy enough to understand generational differences, then if our prospect is under 30 years old, they probably don’t use their Facebook account, and if they are under 20, they might not even have one, though perhaps they have Instagram and Snapchat, instead. So we might ask something like any one of these questions, not necessarily in this order and not without waiting for responses and making it more conversational: “Have you posted on Instagram today to all of your fans? What are they missing out on today? Is it fair to say that you’re probably having more fun than they are? Is that the kind of thing you like to show each other? What are they expecting to see when you send them a picture? Are they expecting just a shot of you and your friend and that cool drink in your hand? What would it take to surprise them? Do you like surprising them? Is that what you guys usually do for each other? 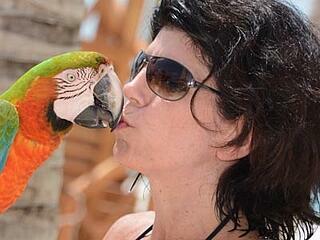 So if they saw a picture of a bird licking your face, would that do it? Would that be a "win?" Would that make them laugh? Tell me about it.” And so on. Okay, this is just one approach and there are lots more, and I was only giving you your half of the conversation. Use your sensory acuity to determine the best conversational direction for your prospect. The point is that you are focused on them, not you. You could ask them if they have a wall of photos at home. “I bet you have lots of friends and family on that wall, and lots of faces, but no colorful tropical animals, right?” Once they are connected to the outcome – a unique post, a more interesting photo wall, or just more cheerful gloating – closing the deal follows naturally. "How about making that happen right now?" 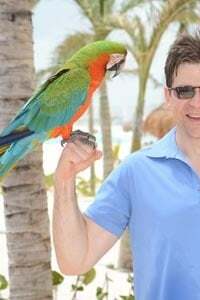 As you read this, you might protest, “But the way they are currently asking is much quicker, ‘Would you like a picture with a parrot?’” See, they can quickly move from person to person, right? Yes, that’s true. But we aren’t interested in speedy conversations, we’re interested in closing more sales. Slow it down to speed it up. You've probably heard that many times before. In your business, ask yourself which part of the conversation you should slow down, in order to speed up the sale? How many of your salespeople can move past product knowledge and become more effective at selling? How many of your sales managers recognize that the products, services, and the intricacies of your industry are only prerequisites to selling and that mastering selling skills is the difference required for high performance? How much of your onboarding includes learning an effective sales process and helping your people clear away the mental blocks and self-limiting beliefs so they can execute it? Take five minutes and fill out this sales force grader to see where you stack up compared to other companies. And if you're interested, click here to receive a white paper on the Modern Science of Sales Force Excellence. The next time you're looking to unwind away from home, I suggest someplace cool and cloudy. It's less labor-intensive.